The Trans Tasman Gubbi Gubbi Waka Ama Championships is the only Australian outrigger canoe championship series exclusively for junior paddlers. 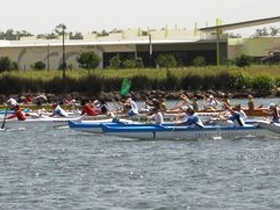 Before 2011, the regatta was the highlight of the season for outrigger paddlers aged between 10 and 19 years of age on the east coast of Australia. From Saturday, 24 September 2011, the Gubbi Gubbi event goes international with New Zealand joining the competition, making this the inaugural Trans Tasman event. Over three exciting days at Lake Kawana, junior paddlers will compete for both personal and national pride in an ideal Sunshine Coast setting.